Dar Lighting Balthazar single light table lamp features a woven globe base in antique gold finish and comes complete with a pale gold faux silk shade. 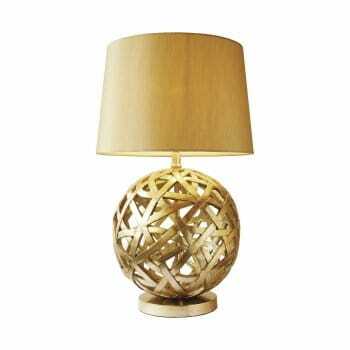 The product code for this Dar table lamp is BAL4263. This striking table lamp would be a talking point and is an impressive decorative piece of lighting, adding a luxurious touch to any room within your home. A wide range of table lamps can be viewed on our website.